Born in Prague in 1737, Josef Mysliveček spent most of his short life in Italy, where for a while he enjoyed success with his many operas, and became known as �Il Boemo� (�The Bohemian�). It was also in Italy � in Bologna � that he first met Mozart, in 1770. Their paths would cross again and in letters Mozart wrote about him with affection, describing him as full of �fire, spirit and life�. Mysliveček�s influence is apparent in Mozart�s early operas, violin concertos, symphonies and keyboard music. His music soon fell out of fashion, however, and it is only recent decades that have seen a growing interest in works such as the wind octets, violin concertos and symphonies. 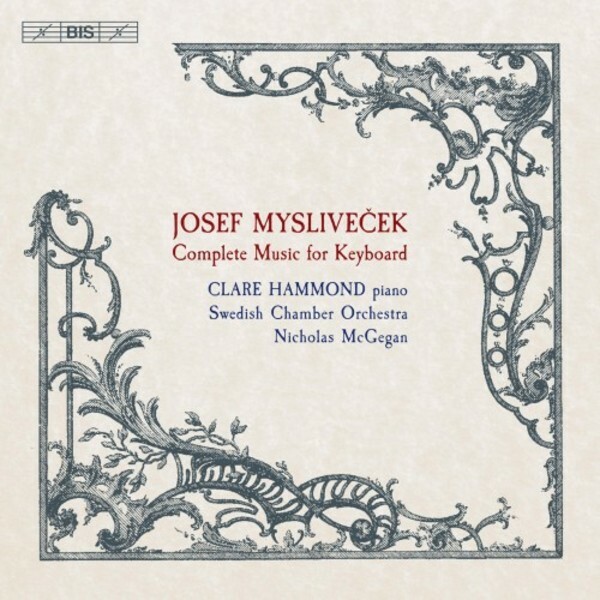 In comparison, Mysliveček�s output for keyboard has been somewhat neglected, something which the English pianist Clare Hammond seeks to rectify with her latest disc. The keyboard concertos in particular have barely seen the light of day since Mysliveček�s death and the second concerto is recorded for the first time on this disc which gathers all of the extant keyboard works. Clare Hammond, whose imaginative recording projects on BIS have received international acclaim, is here supported in the concertos by the Swedish Chamber Orchestra, conducted by none other than Nicholas McGegan, whose expertise in 18th-century style is undisputed. This new recording from pianist Clare Hammond and the Swedish Chamber Orchestra under Nicholas McGegan fills a significant gap in the discography. Josef Mysliveček (1737-1781) was a Czech composer based from 1763 in Italy, where he made important contributions to the opera seria genre that form the basis of his reputation. Born in Prague as the eldest of identical twin sons to a prosperous miller, he looked set to continue in the family trade but instead switched to a career in music, studying with Josef Seger, the organist of Prague�s famous T�n Church. He established a reputation as an excellent violinist before leaving his homeland to study operatic composition in Venice and, apart from brief visits to Prague, Vienna and Munich, never returned to Central Europe. In Italy he was active mainly in Venice and subsequently Naples, where he led a colourful life and cemented his fame as one of the leading composers of opere serie. For some years he was close to the Mozart family, whom he met in 1770 in Bologna, and Wolfgang Amadeus clearly had a high regard for the composer known in Italy as �il Boemo�, although the relationship soured when Mysliveček failed to deliver on a promised Naples operatic commission for the younger composer. Apart from his operas, Mysliveček is known today mainly for his symphonies (all in the Italianate three-movement form), violin concertos and string quintets. Until now, Mysliveček�s few works for piano have received little attention, so Clare Hammond�s complete survey, which at 76 minutes fits onto a single CD, is a welcome addition to the catalogue. (Only a single piano sonata of dubious attribution is omitted.) The main attraction for many will be the two piano concertos. These are compact works (the first lasting just 11 minutes), expertly crafted and revealing an elegance of invention that is immediately appealing. The B flat Concerto (no.1, probably composed, like its companion, in the late 1770s) is alert and nicely poised, and Hammond together with the Swedish orchestra and McGegan, bring out all its charm, not least in the central Andantino with its throw-away ending. Though played on modern instruments, there is an unaffected stylishness and charm to the playing that is immediately appealing. The second concerto, in F major, is a more substantial work, although as in the first the wind instruments (oboes and horns) merely bolster the orchestral tutti passages. The opening movement, with its string swirls, is abundantly characterful, while the third is a buoyant dance in minuet time, with an ear-catching minor-key section that features off-beat punctuation from the strings. But it is the central movement that is the real gem here, a limpid Larghetto with muted violins and pizzicato lower strings accompanying an achingly cantabile solo part. This is music that Mozart might well have envied, and Hammond turns in an immensely heartfelt performance with a gentle touch that has the listener spellbound. It raises the work to a level that ought to see it enter the wider repertoire, and this disc will surely champion its cause. The rest of the disc consists of two sets of �easy� pieces for solo piano. In the case of the six Divertimenti of 1777, the label is particularly apt, for these are nicely turned character pieces that will suit any moderately accomplished amateur pianist, but Hammond�s playing transforms them into exquisite but unpretentious miniatures. The Six Easy Lessons of three years later are once again more substantial (and technically demanding), each comprising a two-movement sonata, four of them concluding with minuets. Particularly attractive are the opening movement of no.3, with its pulsating left-hand accompaniment, and the Minuet with variations that closes no.6 with a series of right-hand cascades. Hammond proves an excellent guide to these works (as she also does in her excellent booklet notes), which are perhaps most redolent of middle-period Mozart, and the whole disc is immensely enjoyable. With a fine recording from the �rebro Concert Hall in Sweden, it will surely bring a welcome boost to the reputation of �il Boemo�.